Hours after Saudi Arabia lifted a 35-year ban on cinemas, the world's biggest movie theater chain jumped on the opportunity. AMC signed a memorandum of understanding with Saudi Arabia's sovereign wealth fund to "explore a range of commercial opportunities for collaboration," according to a joint statement late Monday. Saudi Arabia will begin granting commercial movie theater licenses next year, and it expects the first cinemas to open their doors in March. 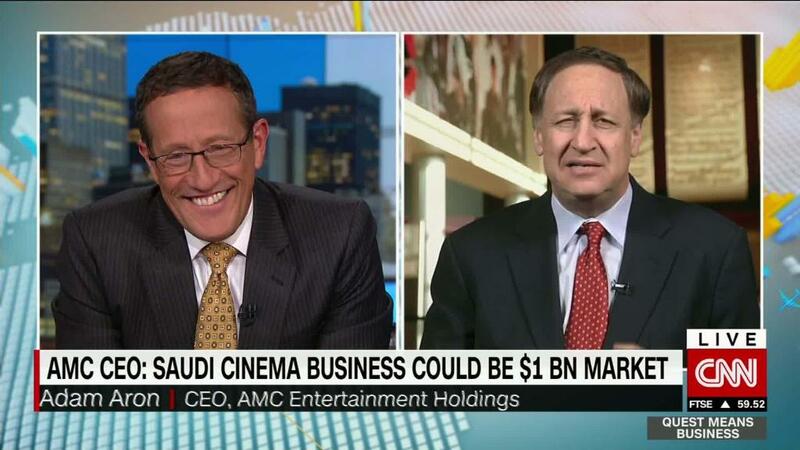 AMC (AMC) CEO Adam Aron told CNNMoney that the new market of 30 million people could one day be worth $1 billion. "We are quite optimistic," he told CNNMoney's Richard Quest. "Our future is lucrative and bright in Saudi Arabia. Let's say the end of  for a brand new theater from scratch." AMC, which is owned by China's Dalian Wanda Group, has over 11,000 screens in Europe and the U.S. But it will have to compete with regional cinema operators for a slice of the pie in Saudi Arabia. Vox Cinemas and Novo Cinemas -- both based in the United Arab Emirates -- are interested in expanding across the border into the new, much bigger market. They already cater to a local audience by having movies subtitled in Arabic and censored to remove scenes of a sexual nature. AMC is also likely to have to adjust what it shows. CEO Aron said he expects that a "similar film product that is currently shown in the Middle East will find its way to the kingdom of Saudi Arabia." The kingdom said in a statement on Monday that movies "will be subject to censorship according to media policy standards of the Kingdom," to ensure they comply with Saudi values and principles and do not contradict Sharia, or Islamic, law. Many Saudis currently visit neighboring countries such as the United Arab Emirates and Bahrain for vacations and leisure time. The Saudi government wants more of them to spend their money at home. It's possible that there will be losers as well as winners from Saudi Arabia's economic overhaul. Shares in Bahrain's Cinema Company dropped 7% on Monday following the announcement that Saudi cinemas would reopen.